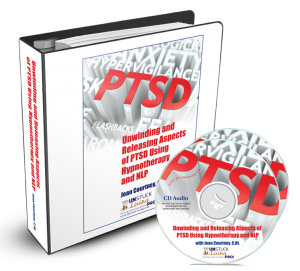 PTSD Home Study Program :: Unstuck Living Pro! PTSD is fast becoming a buzzword these days, not just in therapeutic settings but in our own everyday lives. Just what is PTSD? How do you identify who has this malady? What do you do then? Learn from over 10 years of time tested techniques on how best to work with your PTSD clients. Each process presented is explored and demonstrated. CE certificate units will be awarded after your practice logs of two PTSD client sessions have been evaluated and your examination graded. PTSD is fast becoming a buzz word these days, not just in therapeutic settings but in our everyday lives. Just what is PTSD? What are the hallmarks for causing this condition? How do you as a hypnotherapist identify when someone has this malady? What specifically do you do then? How are pacing and other factors important to working with this group of clients? enabling you to work with your PTSD clients as soon as you complete the course. The audio and video for this course is from the Hypnotherapy for PTSD: Discovering and Resolving the Symptoms workshop held November 9-10, 2013 at Katherine Zimmerman’s California Hypnotherapy Academy. The workbook has been expanded. Joan Courtney is a Clinical Hypnotherapist and a Neurolinguistic Programming (NLP) Practitioner. She’s certified by four major national hypnotherapy associations and is also certified in advanced NLP training. Joan is a presenter at the American Council of Hypnotist Examiners International Hypnotherapy Conference. Having over 25 years of experience in this field, Joan specializes in clinical and medical aspects of hypnosis. Throughout her practice, she has worked with veterans and others affected by symptoms of PTSD related to fire, earthquakes, and physical/sexual abuse.